OMG Posters! » Archive Two New Concert Posters by Lars P. Krause (Onsale Info) - OMG Posters! Germany’s Lars P. Krause has two really great new concert posters going up for sale this weekend. 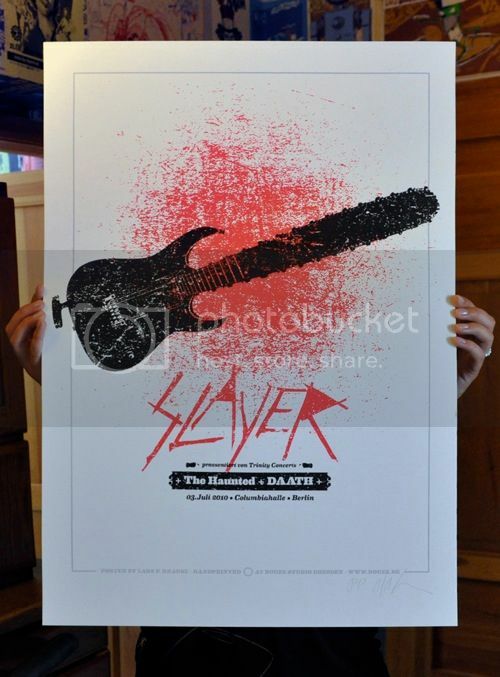 His Pearl Jam poster has an edition of 100 and will be €40, the Slayer poster has an edition of 66 and will be €30. Both of these go up Saturday, July 3rd at a random time. Visit Douze.de. Click either image to see detail/process photos. Out of the Park !!! Best one so far !! Regarding the PJ one. Slayer is great, too. Well done Lars. Best PJ Poster of the tour so far! Great work Lars!